Stock photo of the Vancouver 2010 bobsled outside the 2010 Olympic Office along the Village Stroll in Whistler Village, British Columbia, Canada. 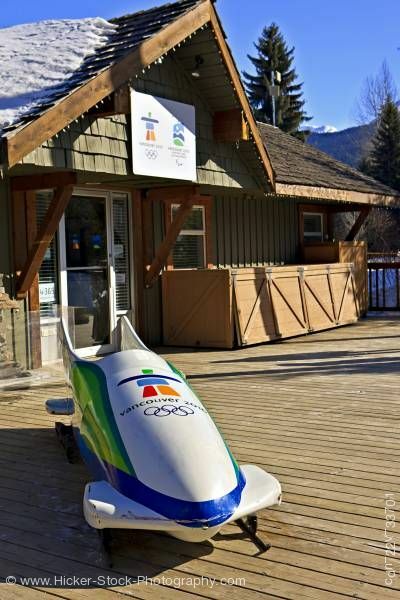 This stock photo displays the Vancouver 2010 bobsled outside the 2010 Olympic Office along the Village Stroll in Whistler Village, British Columbia, Canada. The sled is mostly silver with a blue stripe around the nose and blue and green markings on the sides. The emblem of the games, an iconic inukshuk, is painted on the front. It sits on the large wooden deck out in front of the 2010 Olympic Office. One of the visible peaks of the office's roof is mostly covered with snow and there is a very large evergreen tree and bright blue sky in the background. The Olympic office is manned by knowledgeable staff who can answer any question about the 2010 Winter Games in both Vancouver and Whistler. They have a range of brochures and pamphlets about the venues and the Winter Games themselves.